I enjoy the fact that me having a sad at my food processor and the way it trapped our mixture wasn’t mentioned. It makes us seem like we know what we are doing. b) make these for dinner. Question – can they be frozen? Does the mixture keep? they can absolutely be frozen (probably not for more than a month though). Reheat in a single layer on a cookie sheet in a moderate over for 5 – 10 minutes (keep an eye on them). They’ll also keep in the fridge for a few days. I wouldn’t store the mixture, as is, nope (raw eggs = danger danger!). So I made these and they were amazing. I made about a half mixture, but didn’t weigh my potatoes so ended up having to freestyle the batter a little bit. Didn’t need to worry about freezing them because THEY ALL GOT EATEN WITHIN 24 HOURS! Mostly by me, but also with some help from a work friend, who thought I did a great job. HOORAY FOR COOKING! Thank you New Fat Ladies for inspiring me to actually cook things for myself! YOU’VE MADE ME ALL TEARY! Yummy! I make mine just the same. My favourite accompaniment is a nice piece of grilled salmon. 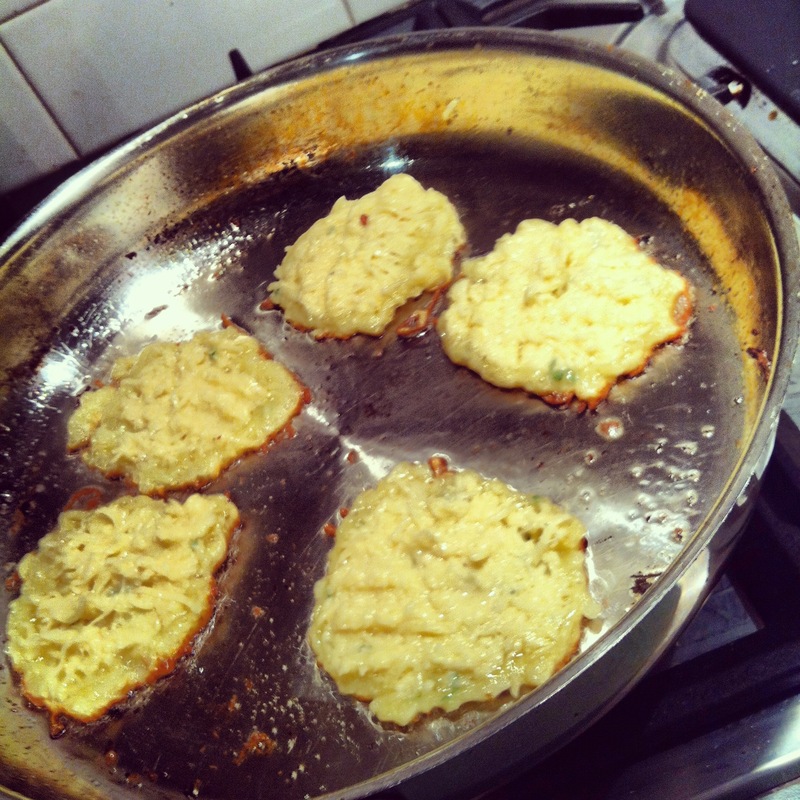 In fact we can’t have salmon in this house unless latkes are made too! Good work! 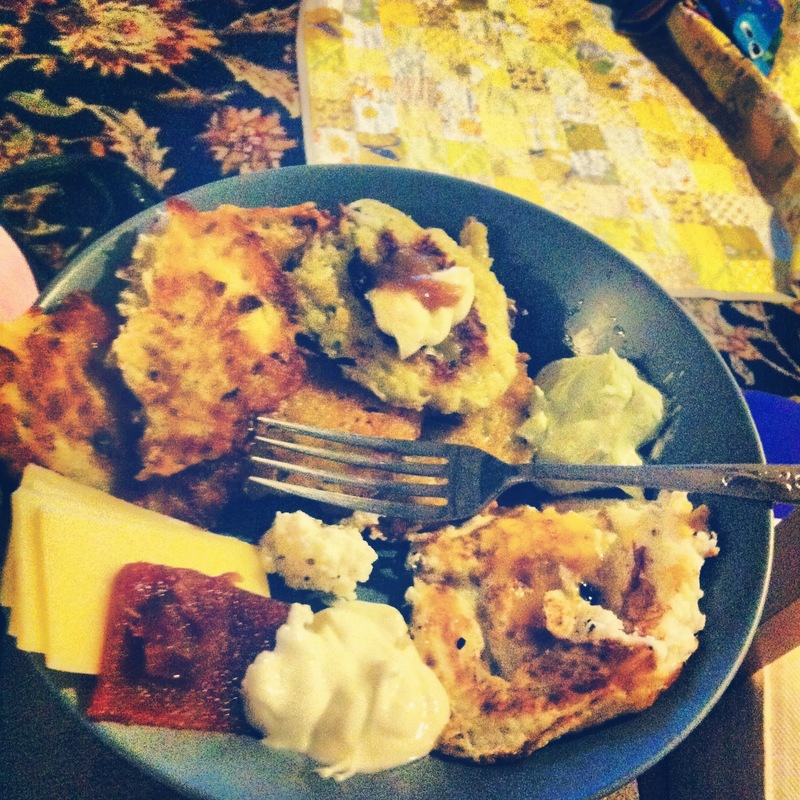 Oh lovely, I’ve not tried salmon with latkes, but now I’ll have to! YUM!